Mobile devices will deliver a more personal internet within five years, using chips with the power of today's desktop PCs, Intel's head has said. Speaking at the Consumer Electronics Show, Paul Otellini predicted mobile devices could soon "augment reality" by pulling data from the net in real time. He said the industry was on the verge of creating a "new level of capability and usefulness to the internet". "It's an internet that is proactive, predictive and context-aware." Explaining that devices would be location-aware, and would access the internet over Wimax wireless connections, he said: "Instead of going to the internet, the internet comes to us. "We need a ubiquitous, wireless broadband infrastructure. Eventually we will blanket the globe in wireless broadband connectivity." Intel is backing Wimax, one of a number of competing next-generation wireless technologies, such as Long Term Evolution and HSDPA. Mr Otellini said for this vision of the future to be fulfilled it would "require exponentially more powerful processors, using less and less power". He said that breakthroughs in chip development were needed to solve the problem of faster chips requiring more power and becoming less efficient. 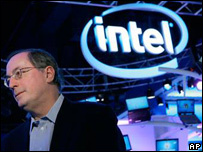 The Intel chief executive said the firm had a roadmap for five more generations of chips, over the next 10 years. "I have no doubt we will make all the breakthroughs necessary to make the five generations happen." He told BBC News: "Intel, as a leader, has to advance the silicon technology every generation. He added: "Everything we do has an inherent belief in technology." At the show Intel unveiled a range of new processors, including chips designed for so-called "mobile internet devices". The first machines to use the new chips, which are 25% smaller than previous generations, are expected to hit the market later this year. "A mobile internet device is something that you carry around in your pocket, and can deliver the full internet, with no compromises," he said. The first devices will be larger than a typical mobile phone but are expected to shrink in size by a factor of four within two years. One of the first devices to use the new Menlo chips is a Toshiba ultra mobile portable computer, which is capable of running Microsoft's processor-hungry Vista operating system. Mr Otellini said the obstacles were not just processing power, but also increased wireless access, an internet which can understand context and simpler computer interfaces, such as gesturing and visualisation.